Director/Producer James Cameron heads deep into the ocean during filming of Aliens of the Deep. Director James Cameron has again plunged into the depths of the sea and returned with Aliens of the Deep, a 3-D documentary of the exotic life on the ocean floor and the potential for even more extreme creatures on other worlds. The film, which follows the exploration of Cameron and a team of real-life researchers along the sea floor, opens today in IMAX theaters nationwide. 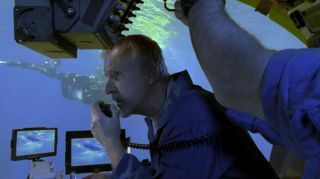 While Deep's three-dimensional format is fun early on during quick flashes of humans and animals - including one fiesty elephant - the film's most poignant views lay thousands of feet down at the bottom of the ocean, which is home to stunning geologic features and a vast array of creatures evolved to live in the complete absence of sunlight. The creatures, dubbed extremophiles, thrive around scalding hydrothermal vents, where life depends on the chemical processes of chemosynthesis rather than the sunlight-dependent photosynthesis that feeds most plant life on Earth. The existence of such organisms on Earth has prompted some researchers to ponder whether similar life could exist on Jupiter's moon Europa, which astronomers believe may have an ocean supported by internal heat tucked beneath its icy crust. Deep spends some time detailing NASA's plans for its nuclear-powered Jupiter Icy Moons Orbiter (JIMO) mission and the possible landing of a probe that would melt through Europa's surface to explore its subsurface ocean. "If this cool biology exists on Earth, then why not at the bottom of some other ocean," Cameron said of the film. But it's the terrestrial extremophiles that steal the show - a wispy jellyfish appears near invisible before Cameron's cameras while a swarm of white shrimp ambush the dive team's robotic probe 'Jake' - from the varied team of marine scientists, seismologists and astrobiologists accompanied Cameron on deep water dives that spanned both the Atlantic and Pacific oceans. At less than an hour long however, little time spent explaining some of the creatures they find - such as an oddly-winged squid - and the forces behind towering geologic formations rising up from the sea floor. Marine seismologist Maya Tolstoy, who appears in the film and studies the potential connection between deep water life and ocean fault lines, told SPACE.com that while she normally just pitches automated oceanic seismometers over the side of research vessels - they pop up on their own after receiving signals to surface - Cameron's Deep dives gave her a chance to actually see the environment she studies up close. "It's only logical to try and understand what we find here on Earth, so that we know what we might encounter [in space], and that we'll have the right tools to detect it," said Tolstoy, a researcher at Columbia University's Lamont-Doherty Earth Observatory. "It's vital." Cameron said his next 3-D feature will be "Battle Angel," a science fiction film based on a series of Japanese graphic novels. Ghosts of the Abyss, his 3-D trip back to the lost ocean liner Titanic, opened in 2002.